It's come down to this. The days remaining in the 2015-16 NHL season can be counted on one hand now. A longer than ideal summer for Calgary is a familiar feeling though given this is the sixth time in the last seven years the Flames have not been invited to the post-season dance. While it isn't something that has snuck up on us by any means, it's still disappointing when the season actually comes to an end for a city that a year ago was busy making 'Red Mile' reservations. We were just about to begin a compelling month of intense and entertaining playoff hockey and to this day, it's a memory that is still fresh. With a lot of things still to talk about, here's a fresh Eight From 80 Feet. As I do periodically, this is my somewhat random collection of eight thoughts on the current goings-on with the Flames. For some time now, there's been a line drawn right down the middle of the Flames D group. It's not a subtle one either, think big, fat, black marker. On one side you have the core of the defence, three guys that will be paid very well -- a smidge over $17 million -- to be the minute-munching foundation of the blue-line for the next several years -- Mark Giordano, TJ Brodie and Dougie Hamilton. Then you have the other three veterans, in which the general feeling is they all make way too much money for their bottom pairing ice time and calibre of play. The very real fear being that their presence is going to severely cripple Calgary's flexibility and options with the salary cap. 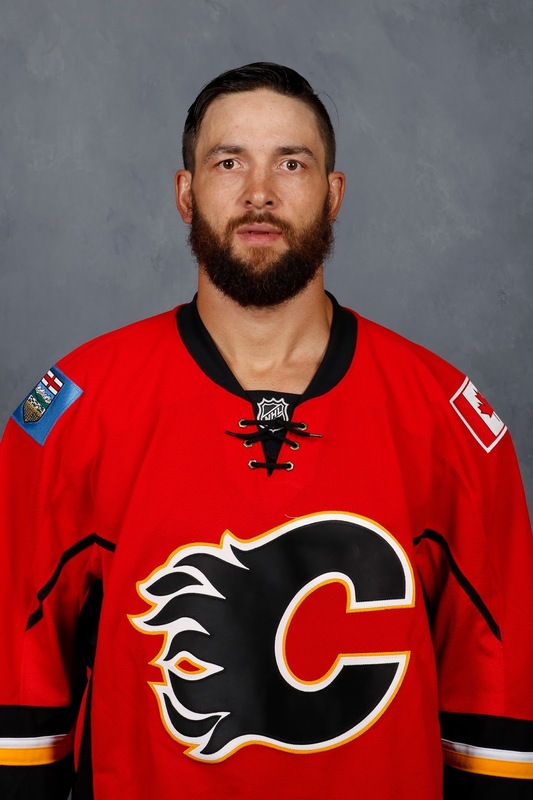 They are Dennis Wideman, Ladislav Smid and Deryk Engelland. However, I don't view this second group as equals. For me, Engelland is not only the best comparative value at $2.9M annually (Smid is $3.5M, Wideman is $5.25M), he's been the best and most consistent player out of that group all year and it hasn't been close. We'll see how the summer unfolds. You know the Flames would love to get out from under at least one or two of those contracts if they can given they also have Jyrki Jokipakka, Tyler Wotherspoon and Brett Kulak. Plus, re-signing pending UFA Jakub Nakladal is another option. While for the reasons I've already stated, I bet Engelland would be the most tradeable of that group, it wouldn't be a bad thing if the rugged defender -- wearing an 'A' these days also, which isn't something to be overlooked -- is back to provide size, toughness, leadership and some bottom six stability. He certainly had himself quite a night Tuesday against the Kings. Obviously it's not the type of offence you'd ever expect to get from him but his first multi-point game of the season -- including a beauty top-shelf shot that was nearly the winning goal, a plus-3, and all while logging nearly 24 minutes of ice time. Good on him, a guy who arrived in camp in September 2014 with a city full of detractors, who has done nothing but quietly put in solid work and has turned around many of those critics. Not only did the Jets pull off a win in extra time in Anaheim on Tuesday, but they did so before the game reached a shootout. There is a lot of significance to those two points coming via a regulation or overtime win as now the tie-breaker favors the Flames should Calgary and Winnipeg end up the season tied. As it stands, Calgary is one point back. Should the Flames pick up a loser point in the next two games and end up level with Winnipeg, that key ROW column is now also even. It never used to be. For the longest time, Calgary held the edge over all teams in that category. So now if they finish even in points, you go to the next tie-breaker which is head-to-head. In the head-to-head given it was a three-game series, the first of the two games played in Calgary (the Flames 4-1 win on Dec. 22) is excluded so it's more fair with equal home games and road games to go by. That also leaves the head-to-head as a split. The Jets won 3-1 at home on Oct. 16 and Calgary won 4-1 at the Saddledome on March 16. 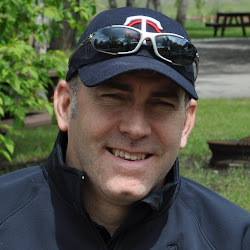 The next tie-breaker is goal differential for the entire season and the Jets (-26) have a comfortable lead over the Flames (-34) in that, giving Winnipeg the tie-breaker now. After Tuesday, there is further clarity as to where Calgary will finish. They can no longer finish lower than 28th so Toronto or Edmonton are out of reach. Also, they can no longer climb any higher than 25th. That leaves the 24th place Arizona Coyotes, who I thought would be in the cellar by a mile this year, also out of range. Thus, there's no longer any reason for Flames fans to feel conflicted Wednesday night when glued to the out of town scoreboard and two noteworthy games -- Columbus playing in Toronto and Vancouver visiting Edmonton, in what really is a double-header of awful. For the residents of Flames nation, it's all about the Blue Jackets and the Canucks. Time to dig out your Mike Palmateer and Espen Knutsen jerseys and root them on. There's still a chance Columbus could still pass Calgary, but they'll need to beat Toronto and still pick up at least one more victory. For now, here are the Flames draft lottery odds via the website tankathon.com should Calgary finish 27th, which is where they find themselves today. The odds of a top five pick are getting better and while top three is ideal, top five isn't bad. 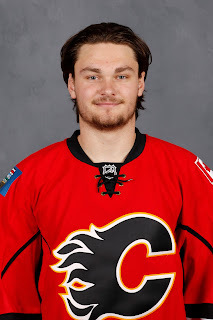 Imagine if the Flames were able to pick fifth and in theory get a player that was something between Sam Bennett (4th overall) and Sean Monahan (6th overall). Dare to dream. By surpassing 20 goals, Mark Giordano joins some pretty elite company in Flames franchise history. Only three others have accomplished that before -- Al MacInnis, Gary Suter and Paul Reinhart. For longtime fans, those are three franchise icons on the blueline. Worth noting is Giordano is the oldest to do it by far. Although nobody should be surprised as he's been a late bloomer his whole career. It still feels like he's just getting going, which is a good thing considering his extension is just about to kick in. With the Memorial Cup in Red Deer this year, it would make for a short drive for Calgarians to head up the highway and see some of the Flames top prospects in action. Three notable prospects -- all top 10 in the January edition of my Flames Top 20 Prospect Rankings -- have moved onto the second round of the CHL playoffs. It took seven games but the Colts prevailed 5-1 over Mississauga on Tuesday in the deciding game to move on and face North Bay in round 2 of the OHL playoffs. Interestingly, North Bay is the same opponent that has ended Barrie's season the past two years so you know they'll be motivated. It's a 2-3 match-up in the OHL's Eastern Conference with Barrie getting home-ice advantage. In that opening series, it was same old, same old for star forward Andrew Mangiapane (4-4-8) and impressive defenceman Rasmus Andersson (2-7-9), who were both major congtributors. A good opening series for goaltender Mason McDonald helped Charlottetown pull off a mild first round upset, beating Rimouski 4-2, to move onto round 2. This will meeting be a stiff test as the Islanders, ranked 9th of the QMJHL's 16 playoff teams, will face No. 2 ranked Shawinigan. In starting all six games so far, McDonald has a 2.72 goals-against average and a .922 save percentage. With two overtime games in there, he's faced an average of over 38 shots per game. Both second round series will get going on Thursday. 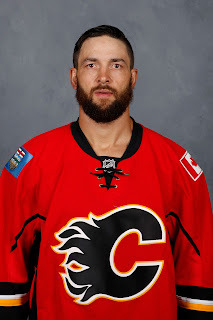 In his recent 30 Thoughts weekly column, Sportsnet analyst Elliotte Friedman reported that the Flames, Predators and Penguins were the leading candidates to sign free agent Czech forward Daniel Přibyl. Přibyl, who Friedman describes as 6-foot-3 and 220 pounds, was a sixth round draft pick of the Montreal Canadiens in 2011. The 23-year-old is coming off his best season in the Czech league in which he was 16-29-45 in 45 games with Sparta Praha. He added 5-6-11 in nine playoff games. It's no surprise Calgary would be interested in a player like this considering he's listed as a centre/winger, who shoots right. That's correct, he shoots r-i-g-h-t. If you see a top nine forward in that mix, you've got better eyes than me. 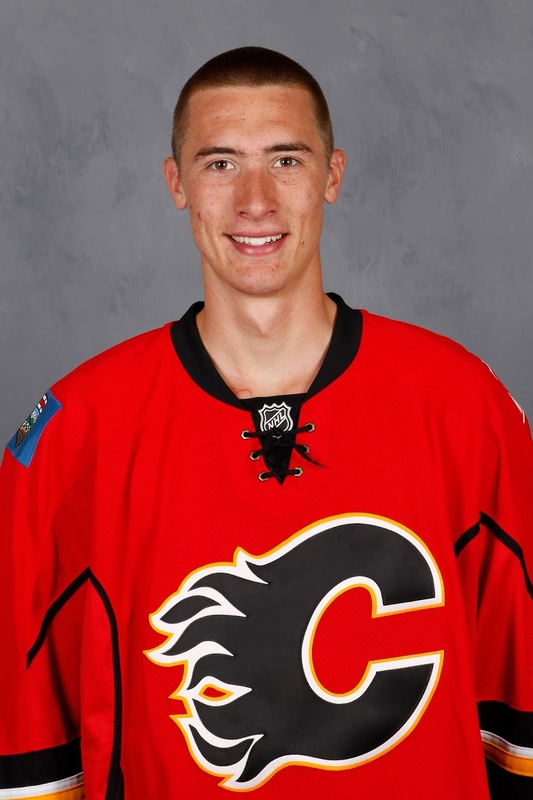 I like Hathaway a lot and think he would be a perfect fourth line player on this team next season but I wouldn't call any of them a lock to be on Calgary's opening night roster next October. Sure, Jooris has two NHL seasons under his belt, but I don't think it's a slam dunk he's still in the organization in six months. 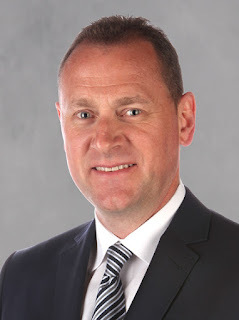 We'll see if general manager Brad Treliving can close the deal on Přybil. Regardless, I still fully expect right wing to be a position that is addressed in the off-season via signings and/or trades or the draft if the lottery gods smile on Calgary. There's been some confusion around goaltender prospect Nick Schneider, who went undrafted last year but was signed by Calgary in training camp, and where he fits into the club's future plans given he's now in Stockton and playing well. First thing to know is he's only in Stockton because his major junior season is over. When the Medicine Hat Tigers season ended, he became eligible to join the Flames minor league affiliate, regardless of the fact he is only 18. 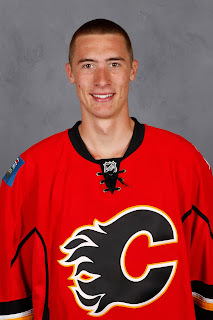 Flames prospect Nick Schneider, 18, has gone 2-1-0 with a 2.02 GAA and a .940 SV% since joining Stockton after Medicine Hat's season ended. Understand, however, that how he performs right now will have zero bearing on where he'll play next season. As a 1997 year-of-birth, Schneider is not age-eligible to be assigned to the AHL in 2016-17. 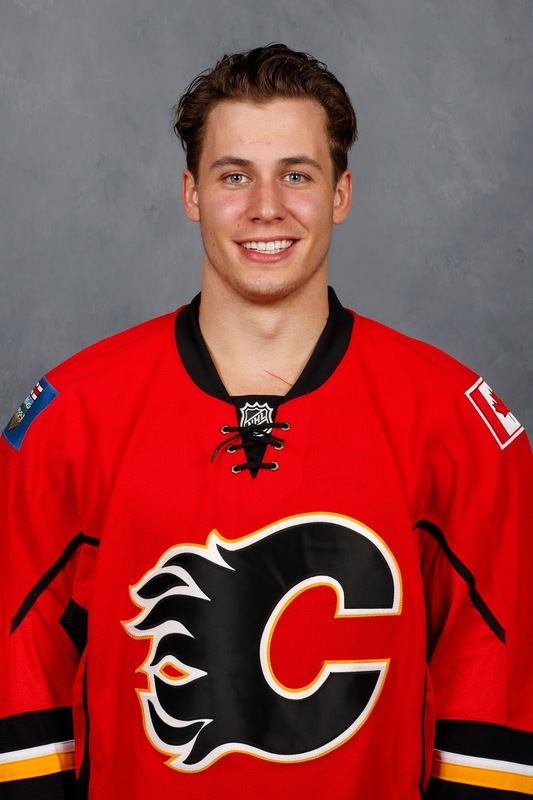 So he'll be at rookie camp, will be at main camp, then will be heading back to Medicine Hat. Meanwhile, expect some more to join Stockton for their final stretch. 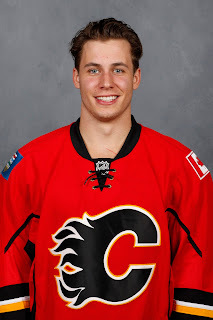 Keegan Kanzig, who began the year with the Heat before being returned to the Calgary Hitmen, has re-joined the AHL team. Kanzig had quite the unexpected season offensively. After scoring just six goals total in his first four WHL seasons, he tallied 13 in his overage year. That's pretty much insane. The other guy you would expect to head to California to get in a few games is Brett Pollock, the 20-year-old forward picked up from Dallas as part of the return in the Kris Russell trade. Pollock played for the Edmonton Oil Kings in the WHL, who were eliminated on Tuesday by the Brandon Wheat Kings. Next training camp, Pollock will in the same situation as Morgan Klimchuk was this season and like Klimchuk, I'd also expect the 2014 second round pick to forgo an overage season and turn pro. I haven't heard anything official about Pollock but given he's got a pro contract, I'd expect him to go down the same path as Schneider and Kanzig. By my math, the Flames have one regular recall left. Joni Ortio was one, Garnet Hathaway was one and Derek Grant was one. There's been a lot of players coming and going from Stockton the last couple weeks but most of it out of necessity so the likes of Wotherspoon, Freddie Hamilton and Emile Poirier were all emergency recalls, who had to be returned when the emergency roster situation no longer existed. A have a hunch and this is strictly gut feeling but I wouldn't be surprised if Calgary dips to Stockton and brings up Turner Elson for the final game of the season on Saturday. He's been a terrific player for the Heat, a good soldier for the organization. He's had a nice season (13-16-29 in 58 games) for someone who has never been viewed as a high-end prospect and from what I've heard, he's been a very popular player with the fans in Stockton. He's one of those likeable guys that just gives his all. It would be a nice reward for the 23-year-old, who has never played an NHL game, but this may be more of a dream than reality. Given how much disdain there is for being limited to only four recalls after the trade deadline, it would seem odd though that this year of all years, with no playoff race, that they don't use up all four of them but they're certainly leaving the final one pretty late. Bill Arnold, one of the leaders in Stockton, is another guy to consider. As a late bonus entry to today's list of eight, coach Bob Hartley announced Wednesday that Joni Ortio and Niklas Backstrom would start the Flames final two games. Ortio gets the Canucks at home on Thursday. Backstrom gets another shot at his former team in Minnesota on Saturday. That means Jonas Hiller appears destined to finish the year with an .879 save percentage, which will be the lowest mark in the NHL over a full season in the last decade. Barring a relief appearance, Jonas Hiller will finish with a .879 SV%, worst over an 82-game season since Andrew Raycroft's .879 in 2005-06. If you go four decimal points, Andrew Raycroft's .879 was marginally worse than Hiller's. The only other sub .880 mark in the past dozen years was New Jersey's Scott Clemmensen in the lockout-shortened 2012-13 season. He recorded a .874 that year with the Devils. It's a dubious distinction for Hiller and puts an ugly exclamation mark on the position that caused this team so much grief the first couple months of the season. The three-headed monster was a three-headed disaster. The club's poor record that resulted in October ultimately cost Calgary any realistic chance of a return trip to the playoffs.